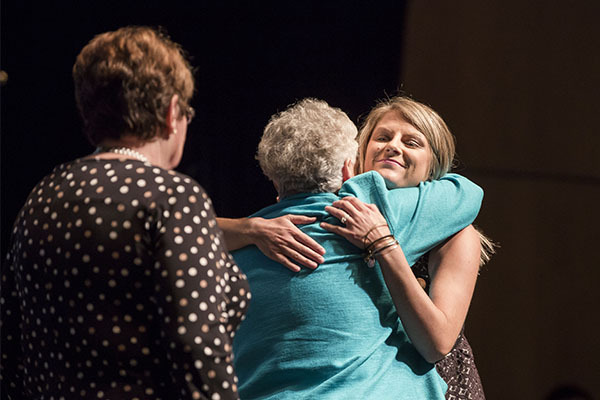 The largest number of students — 370 graduates — in the Vanderbilt University School of Nursing’s 108-year history graduated from their academic programs and were celebrated in pinning ceremonies Sunday, Aug. 5, at Langford Auditorium. 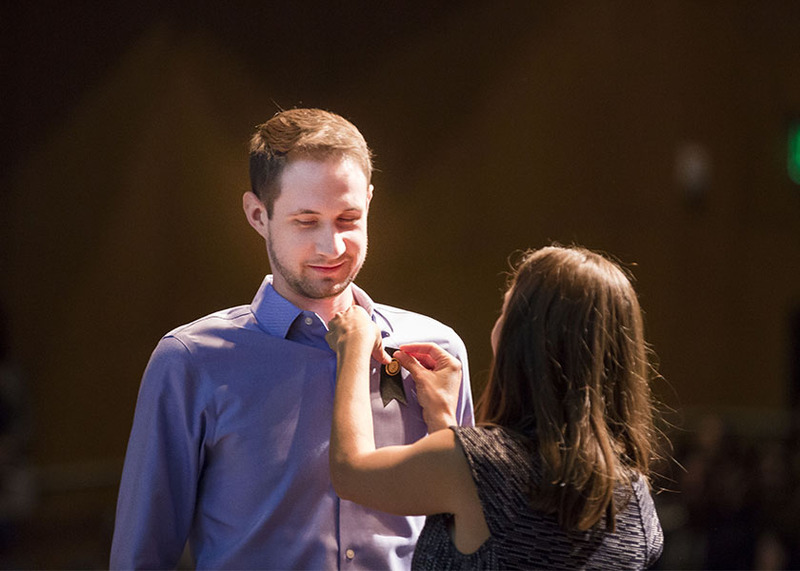 The 276 Master of Science in Nursing students in attendance received the VUSN pin signifying their entrance into the advanced practice nursing profession. 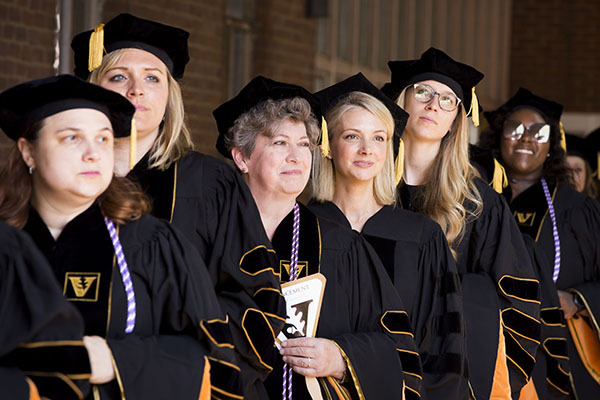 Twelve Doctor of Nursing Practice degree students received lavaliers to attach to their nursing school pins, while 11 advanced practice nurses received Post-Master’s Certificates denoting that they had finished specialty education beyond their master’s degrees. An additional 71 students were unable to attend the ceremonies. 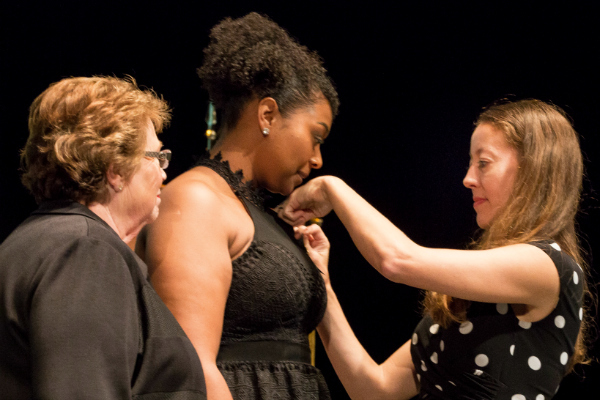 Pinning is a treasured tradition unique to nursing, with each nursing school having its distinctive pin identifying its graduates, explained Dean Linda D. Norman, DSN, FAAN, and the Valere Potter Menefee Professor in Nursing. While the tradition can be traced back to the Crusades, its modern significance began with Florence Nightingale, who presented medals of excellence to her nursing graduates. Two additional student awards were announced. The Amy Frances Brown Prize for Excellence in Writing went to AGACNP student Kristina Holmes for a paper on hepatorenal syndrome. The VUSN Alumni Association Award for Student Excellence in Service and Leadership to School and Community was presented to Anne Sizemore. The FNP student was recognized for volunteerism at Shade Tree Clinic, participation in the Vanderbilt Program for Interprofessional Learning and involvement in the Cal Turner Program for Moral Leadership. Dean Linda D. Norman and AGACNP Specialty Director Brian Widmar congratulate graduate Kendarius Talton (center). Left, Dean Linda D. Norman, DSN, FAAN, congratulates graduate Mary Ann Enriquez after AGPCNP Specialty Director Leslie Hopkins pinned her. 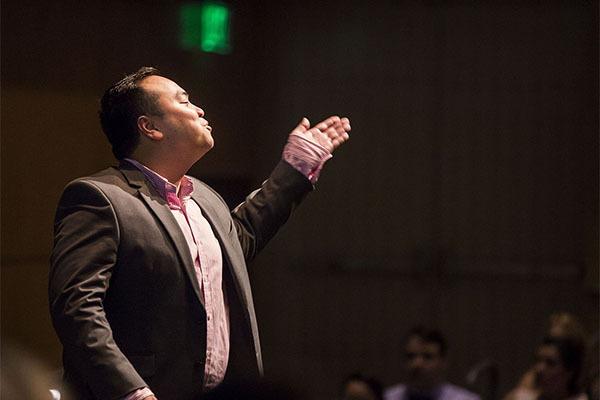 Family Nurse Practitioner student Phat Ho blows kisses to the cheering audience before being pinned. 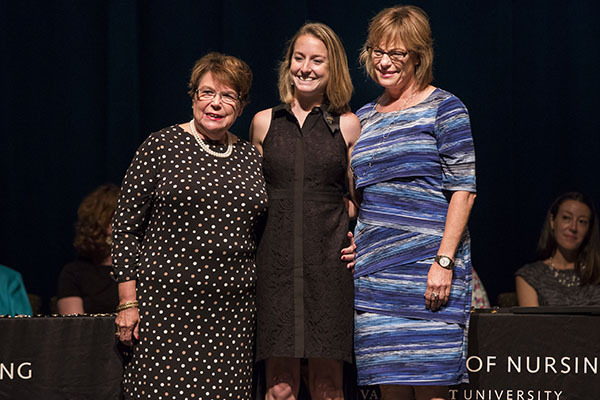 VUSN Alumni Association Board Member Cathy Maxwell presents FNP student Anne Sizemore with the association’s award for student excellence in service and leadership. Family Nurse Practitioner Specialty Director Courtney Pitts presents the specialty’s outstanding student award to Susanna Spero. 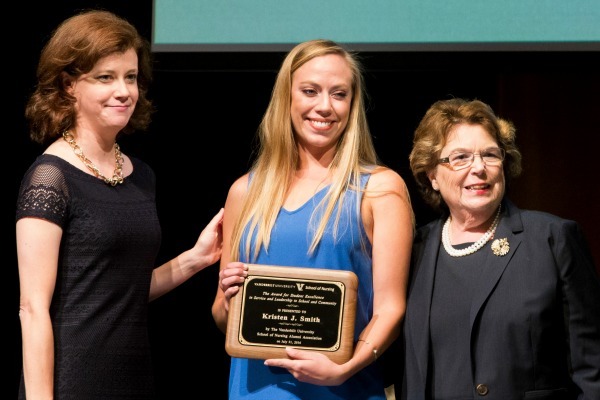 Left, Virginia Gardner received the student-voted Sara K. Archer outstanding teaching award for the PMHNP specialty. To her right are fellow PMHNP faculty Vaughn Sinclair and Susie Adams. Shannon Storey (center) was one of 12 Doctor of Nursing Practice students to receive lavaliers from DNP Director Terri Allison (right). With them is Dean Linda D. Norman. Left, Dean Linda D. Norman watches as Karen D’Apolito is hugged by neonatal student Jacqueline Weidauer. Pediatric Nurse Practition-PC Specialty Director Brittany Nelson surprised Darshi Edirisooriya with the specialty’s outstanding student award. Dean Linda D. Norman, FNP graduate Vanesa Abad and Specialty Director Courtney Pitts after Abad’s pinning. The Nursing Informatics outstanding student award went to Josh Viele, here with specialty director Trish Trangenstein after the presentation. Tamika Hudson, chair of VUSN’s School Life committee, awarded the school’s Amy Frances Brown Prize for Excellence in Writing to AGACNP student Kristina Holmes. Pediatric Nurse Practition-PC Specialty Director Brittany Nelson pins student Damon Perry.